I become so frustrated when I can’t match my practice times at meets! I tend to overthink my strokes and race plan, which makes me distracted. I worry too much about my competitors and they get into my head. I wish I could race with the same confidence I have in practice. I perform tight, cautious, and afraid to disappoint others during meets. Dr. Patrick Cohn is a master mental training expert at Peak Performance Sports. Dr. Cohn works with athletes and teams worldwide from a variety of sport backgrounds including swimming. As the president and founder of Peak Performance Sports (Orlando, Florida), Dr. Patrick J. Cohn is dedicated to instilling confidence and composure, and teaching effective mental game skills to help swimmers perform at maximum levels. In addition to working with swimmers and teams, Dr. Cohn teaches parents, coaches, and athletic trainers how to help these athletes achieve peak performance through mental game skills. If you are under performing in races, it’s time to look at your mental game instead of do more laps in the pool or dry training. You can get expert peak performance coaching with us from anywhere in the world. You can engage in a mental game coaching program via Skype, phone, FaceTime, or GoTo Meeting from the comfort of your home or hotel. Today’s video technology allows us to connect with athletes and coaches all over the globe. Consistently take your practice into every meet. Use prerace routines to raise the consistency level of your performance. Learn mental strategies to improve and cope with distractions. Learn how to swim with effortless speed instead of hitting the wall. Stop under-performing at meets today and take control of your thinking. 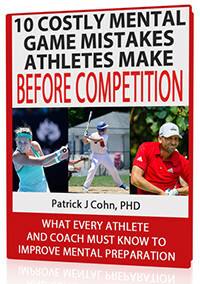 You can get peak performance training with Mental Game Coach, Dr. Patrick Cohn. You can opt for one-on-one sessions with Dr. Cohn in Orlando, Florida, or you can stay where you are and get coaching from anywhere in the world via telephone, Skype, or video-conferencing—also with Dr. Cohn, personally. One-on-one peak performance coaching is the fastest and most effective method to improve your performance and reach new PBs. We have a variety of mental coaching programs to choose from. Please call us at 888-742-7225 with your questions.